Joshua 22:19 describes Shiloh as the place “where the LORD’S tabernacle stands.” During the midst of the allocation of the land to the various tribes of Israel, all of them gathered at Shiloh (Shilo) and set up the tent of meeting or tabernacle (Hebrew mishkan) (Joshua 18:1), which is also called the house of God in Joshua 18:31. Here they made the final division of the land (Joshua 18:8-10). 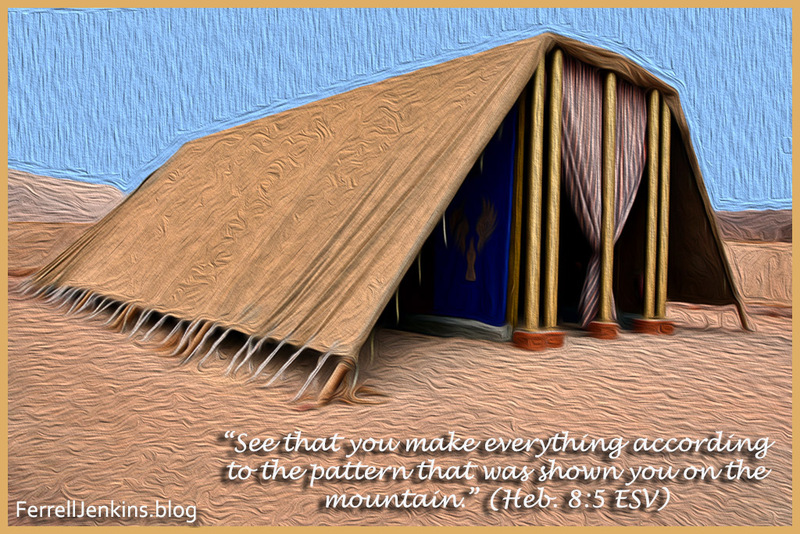 A popular view is that the tabernacle, or tent of meeting, stood in this area of Shiloh for many years. Photo by Ferrell Jenkins. Below is a photo of the tabernacle in the wilderness in the park at Timna, a few miles north of Eilat. These photos are not high-resolution but are suitable for use in teaching presentations. The tabernacle in the wilderness as shown at Timna near Eilat, Israel. Oil adaptation from a photograph by Ferrell Jenkins. Our next photo shows a section of the Canaanite wall (1640-1600 B.C. ), and below it a portion of the Iron Age wall with a couple of large clay jugs from the Canaanite period. 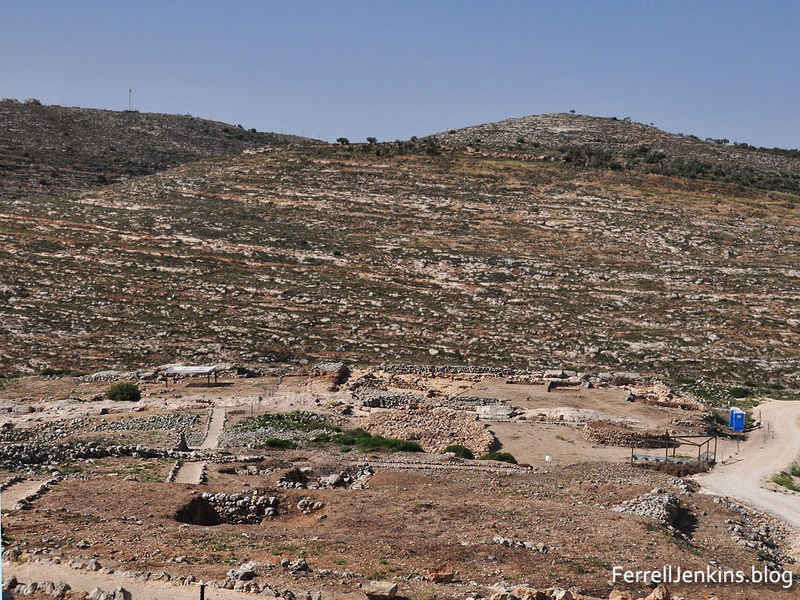 The massive Canaanite walls remind us of the repeated statement of Moses in Deuteronomy. The wall of large stones at the back of the photo is a Cannanite Wall (Middle Bronze – 1650-1600 B.C. 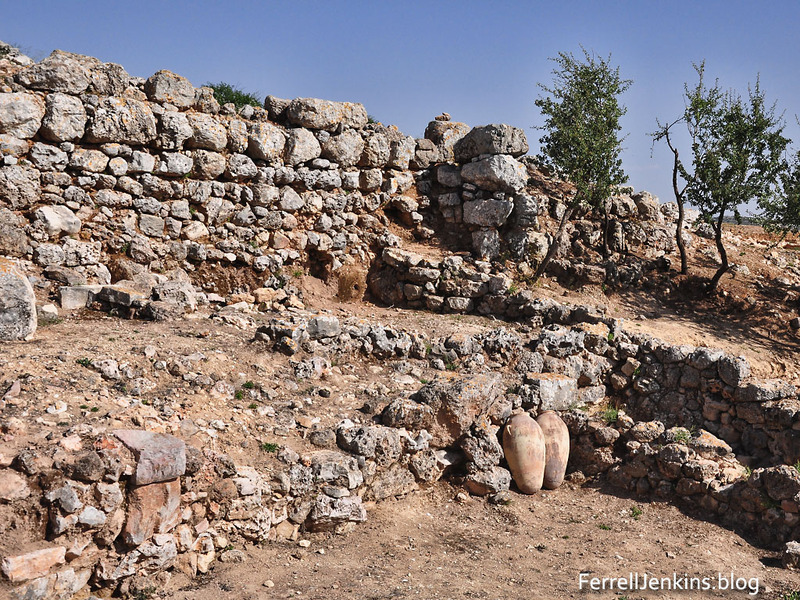 The lower walls in the foreground is from Iron Age I houses from the time of Samuel, but the large clay jars, several of which were found in storage rooms, belong to the Canaanite period. Photo by Ferrell Jenkins. Last Sunday I was listening to a sermon about Hannah as she prayed to the LORD for a son at Shiloh. Eli the priest observed her praying silently, and told her that God would grant her petition. In due time Samuel was born to Hannah and her husband Elkanah. In what many would see as an unusual move, Hannah promised her son to the service of the LORD. Taking a sacrifice to the tabernacle in Shiloh this couple brought “a three-year-old bull, an ephah of flour, and a skin of wine” (1 Sam. 1:24 ESV), and the son that she had promised to the LORD. She tells Eli that she has lent the son to the LORD for as long as he lived. Elkanah and his wife went home to Ramah, but Samuel stayed at Shiloh and ministered to the LORD in the presence of Eli the priest. Samuel would become the last of the judges of Israel, and the first of the prophets (Acts 3:24; 13:20). As a prophet he would anoint both Saul and David as kings of Israel. Two books of the Old Testament are named for him. We have archaeological examples of these three-pronged forks used in connection with sacrificial offerings at pagan sites. Notice this example displayed in the Israel Museum. 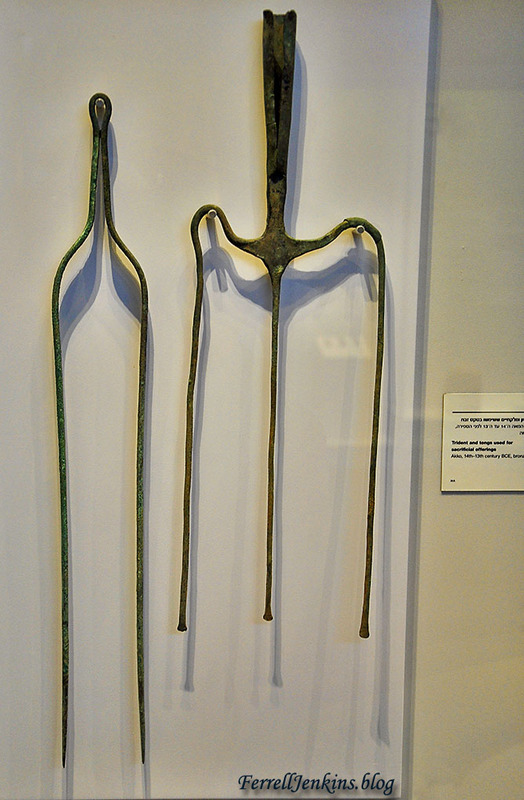 Trident (three-pronged fork) and tongs from Akko displayed in the Israel Museum (14-13 century B.C.). Photo by Ferrell Jenkins. The 2018 excavation at Shiloh, under the sponsorship of the Associates for Biblical Research, and directed by Dr. Scott Stripling, is in its second week. A report on the first week and links to the work from last year may be read here.